This post originally appeared on DipNote, the U.S. Department of State Official Blog, on October 31, 2014. Jordan, a relatively small country of 6.5 million people, has welcomed more than 620,000 Syrian refugees since 2011 (Jordan also hosts Palestinian and Iraqi refugees). This statistic only includes registered refugees, although many thousands more are believed to have entered Jordan without registering. This is equivalent to 27 million people entering the United States, more than the population of Texas. All of these people need housing, water, and food. Health and education systems have stretched to accommodate the new arrivals. Despite a strong desire to help, Jordanians are understandably concerned about the resources required to support their needs. Last week, I met with refugees and the humanitarian workers running their assistance programs to learn more about how the United States and international community are responding. I visited the Za’atri Refugee Camp which, which houses 78,000 residents. I also had the opportunity to speak with Syrians living with family and friends in the neighboring community. Because non-citizens cannot legally work within Jordan, all are dependent on international aid for their survival. As expected, the first concern for all the refugees, whether in a camp or not, is adequate food for their families. The World Food Programme (WFP), with extensive support from USAID’s Food for Peace program, helps meet this need. But feeding such a large population is neither easy nor cheap. In fact, it costs $23 million per month. One reason I went to Jordan was to observe how these funds are being spent, and the impact this support is having both on the refugees and on Jordan. What I saw was encouraging. Recent reforms to U.S. food assistance regulations have provided flexibility for USAID to choose between in-kind food assistance or the use of cash and vouchers to allow refugees to purchase their own food. This flexibility is important in Jordan. 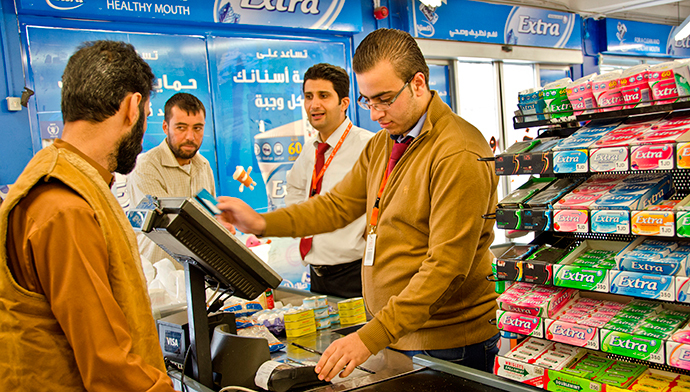 As a stable and relatively prosperous country, Jordan has well-developed markets. However, as trade routes into Syria and Iraq have been cut, the economy has contracted, leaving farmers less able to export the food they produce. By giving Syrian refugees the ability to purchase the food they need through the local markets, WFP is supporting the existing market system, contributing to the Jordanian economy, and helping to dispel concerns that refugees will drain Jordanian resources. Vouchers also give Syrian refugees access to a more diverse diet which can better meet their nutritional needs. 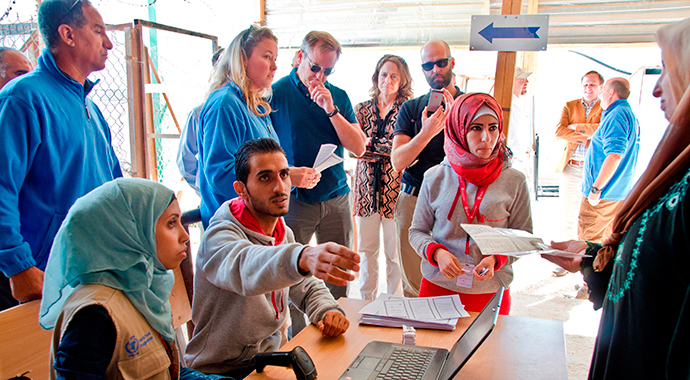 WFP and USAID elected to provide their support through vouchers and pre-paid credit cards, enabling Syrian refugees to purchase food in nearby stores. While this seems like a small matter within the bigger picture of having to flee war in one’s homeland, the difference in how assistance is delivered has a large impact on how well people survive such difficult times. One refugee described the dignity and sense of normalcy she feels when she walks into a store, chooses the food she wants to buy, and pays for it with a credit card. While the efforts of WFP, USAID, and other donors are essential to helping Syrian refugees cope in very difficult times, the programs also help support the Jordanian economy by compensating farmers and entrepreneurs for their efforts, helping keep markets stable, and promoting economic activity that benefits Jordan and the people who call it home. Ambassador David Lane serves as the United States Representative to the United Nations Agencies in Rome.